Jean-Luc Melenchon speaks to thousands at his France Insoumise party's rally. 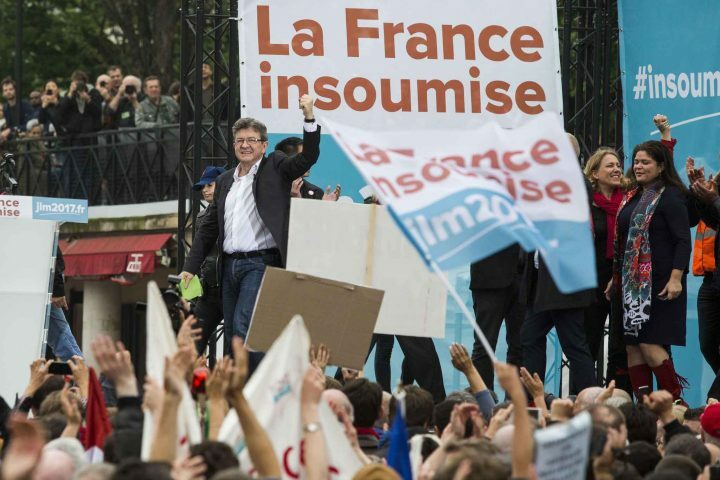 In particular, there has been a doubling of the ratings for Jean-Luc Melenchon of the movement called “France Insoumise” (“France Unbowed”) with his strong campaign against austerity policies and their consequences. In the last two weeks of March, his personal approval rating more than doubled from 19% to 47%. By comparison, the official candidate of the ruling so-called Socialist Party, Benoit Hamon, is fighting a losing battle after years of his party’s unpopular pro-business policies in government. French capitalism, with all its apologists and representatives, offers no way out of stagnation, joblessness, cuts in welfare and authoritarian government. The “flour-bombing” of Francois Fillon, the main candidate for the Republican right, in Strasbourg last Thursday is just one sign of frustration and “disrespect” for those who represent the establishment. On April 4, the second TV debate of the campaign, with all eleven of the declared candidates participating, turned the tables on them quite dramatically. Arguing an impressive case for taking wealth and power out of the hands of the bankers and big corporations, Melenchon increased his score yet further. Philippe Poutou , the candidate for the New Anti-capitalist Party (NPA) – a postman’s son and a car-worker – set the cat among the pigeons. Attacking pampered and corrupt politicians with their hands in the public till – especially Francois Fillon and Marine Le Pen – he spoke of the contrast with life on a worker’s wage and no immunity from prosecution. With two weeks left before the first round of voting on April 23, Melenchon has been predicted to get 17% of the vote as against 19% for Fillon and could even overtake him. A poll taken after the second TV debate said Melenchon had convinced 25% of the six million people who watched it that he should get their vote, compared with just 11% for the front-runner and far-right candidate, Marine Le Pen. Melenchon ’s campaign, with its mass rallies and innovative use of communication technology, is effectively voicing the rage of the workers and youth of France against the pampered, swindling elite who live in luxury while the majority face austerity and joblessness. As the Daily Telegraph puts it, on April 6: “The dying Socialist Party can no longer hold on to its working class base … after pledging Keynesian reflation and an avalanche of jobs,” (This is reminiscent of what happened to the Mitterand government of 1981 which began by more seriously attacking the banks and big companies and ended up following their orders). Unemployment , at 4.5 million, is twice as high as in other major European countries and stands at 25% for young people. Towards the end of March, the official candidate of the ruling party – Hamon was overtaken by his rival on the left, Jean-Luc Melenchon , after they failed to get an agreement for a joint campaign. Melenchon resigned as a Socialist Party MP in 2008 and, after 35 years as a member, left the party over its pro-business policies. In 2012 he stood in the presidential election and got 11% in the first round. In recent years, Melenchon has attempted to form a “Left Front” with the Communist Party, ecologists and others but the project has been hampered by the Communist Party’s alliances with the PS at a national and local level. Melenchon himself, while popular with workers and launching his presidential campaign early, has been slow to get a real alternative organised. Neither his own “Party of the Left” nor his movement, “France Unbowed,” has had an effective structure of branches and meetings to decide on policy, activities and candidates. But the appeal of this 65 year-old’s talk of “a citizens’ revolution” has seen his organisation grow to a third of a million members. His YouTube subscribers number 260,000 (more than all the other candidates put together) and he draws crowds of tens of thousands to hear him speak – in person or as a hologram! Op to 110,000 marched to the Bastille with him on February 19 – the day of the commemoration of the 1871 Paris Commune. Tens of thousands have flocked to listen to what he has to say about the issues of the day – more than the numbers turning out for other candidates of the right or the left … even for Marine Le Pen, until now, the only candidate seen as certain to go further than the first round of the election. Melenchon ’s program includes raising the minimum wage by 15%, shortening the working week to 32 hours, a sixth week of paid holiday, lowering the retirement age to 60 and heavy progressive taxation finishing with 100% tax on anyone earning 20 times the median income. He sees the European Union as a “neoliberal” block in the way of implementing these policies and advocates leaving NATO. Although a former Trotskyist, Melenchon does not talk, as the CWI does, of an alternative socialist Europe. He also stops short of advocating the key measures necessary for dealing with the multinationals, the banks and the share-holders – that is, nationalization of the banks and monopolies and democratic socialist planning. But his ideas and his enthusiasm are undoubtedly what makes him popular. In a recent poll, Melenchon has been voted the politician the French would most desire “to play an important role in the future” ahead of Emmanuel Macron and a long way from Marine Le Pen – the two most expected to be in the second round run-off (with scores estimated at around 25% each). The former ruling parties of the French right and ‘left’ are now so discredited that it is possible that neither of them will appear in the second round of voting and therefore neither of them hold the presidential post. This would be unprecedented since the establishment of the Fifth Republic by President De Gaulle in 1958. The implosion and break-up of what was a social-democratic party is already well-advanced. It has happened before (in the post-war period) and can happen again. The disintegration of the Gaullist right could also be well under way. The “National Review” website comments that “many voters are in burn-it-down mood.” In the ferment, new opportunities will open up for the building of a genuine socialist left. Last Spring, France was engulfed in a wave of strikes and mass demonstrations. This April, the country is in turmoil on the political plane. Behind the volatility and unpredictability is a tense social situation. The state of emergency, imposed after horrific terror attacks, is still in place, with a sometimes provocatively heavy police presence on the streets. In March, new disturbances broke out in the deprived suburbs of Paris and elsewhere. There is no slowing down in the number of often small but bitter strikes breaking out – in response to attacks on wages and conditions, cuts in services or high-handed attitudes on the part of pampered bosses. Now, France is a experiencing “a bonfire of the elites,” as The Economist expressed it. Markets have already begun calculating the repercussions of a Le Pen victory. Among her many anti-immigrant, anti-Muslim, anti-EU, anti-globalization policy statements is a commitment to a referendum on the EU, cashing in on the hostility to neo-liberal policies. She says that the euro has been used as a weapon against countries like Greece to force them to implement austerity programs. Le Pen proposes dropping the euro for the franc and organizing a parallel currency like the ECU of the past. By no means all of the FN’s voters support this policy – an estimated 60% does and only one fifth of the electorate as a whole. Le Pen has widely boasted that her victory will be an anti-establishment vote, following on from the ’surprise’ votes she welcomes for Brexit and for Trump. (Publicly, her optimism has not been dented by the lower than expected vote for her co-thinker, the far right Wilders in the Netherlands election has not dented her optimism.) She sees herself continuing the pursuit of France’s national interests rather than global ones, supporting French workers as opposed to immigrants and small businesses rather than the big French bourgeois elite. Her policies are not openly fascist but she is a supporter of outright reaction at home and abroad. Visiting Putin in Moscow recently she expressed approval of some of his most right wing policies and promised support for the lifting of sanctions over Ukraine and Crimea (a policy shared with the right wing Republican candidate, Francois Fillon). Marine le Pen has shed some of the worst aspects of the old National Front’s image, even its name. She campaigns simply as ’Marine!’, claiming to be fighting ’In the name of the people’. But, her niece, the FN MP for Vaucluse, Marion Marechal-Le Pen, is a virulently anti-abortion practicing Catholic and plays the role of “a tool for rallying the hardliners” (FT, April 1). Marine herself has a think-tank called “The Horaces” which has drawn up plans for all contingencies, including a discussion of which military commanders can be trusted in the event of a President Le Pen declaring martial law”! Many a candidate who might have been running against Le Pen in the first round has already left the field. The current president, Francois Hollande, never even started out. He has not exercised his right to stand for a second term – this is also unprecedented in the life of the Fifth Republic. His decision is hardly surprising, given the unprecedentedly low ratings he has enjoyed during his tenure of the post – hitting a nadir of just 4%. Hollande’s party – the so-called Socialist Party – in power for the past five years – is also hugely unpopular and in danger of breaking up and disappearing from the political scene. Together, president and government have presided over a period of sluggish growth (on average 1%), dwindling secure jobs for young people and enormous social discontent – the direct result of their neo-liberal, fiercely pro-business policies. “The political classes are divided and their fear of the street is palpable” says Tony Barber of the FT.
After last year’s mass movement against changes to the country’s labor law, leading figures in the party who were hoping to be chosen in the primaries as the party’s candidate, such as former prime minister, Manuel Valls, were roundly rejected in favor of the most left candidate – Benoit Hamon who was briefly a minister of education in the present government. His program at least addresses the daily concerns of working and young people about jobs, wages, social spending and increased taxation – of the big companies (as well as robots). Within days of this decision, one of the failed candidates, former prime minister Manuel Valls, declared he would not be supporting the Socialist Party but was giving his support to his former “comrade” Emmanuel Macron, standing as an ’independent’ candidate. Macron split from the PS in a rightward direction less than a year ago to form his own party called “En Marche” (“On the Move!”). More and more leading ‘Socialists’ have declared their support for him, including the former mayor of Paris and the present mayor of Lyon. Emmanuel Macron with a background in banking (Rothschilds), favors a 25% cut in business taxes. At 39 he is the youngest of the candidates, a neo-liberal through and through and a staunch supporter of the EU and its institutions. He has never stood for election before but was appointed by Hollande as economy minister to carry out a wholesale program of cuts. In his new party’s ’economy plan’ he talks of taking Euro 60 million from the budget and sacking 120,000 public employees for a start. He moved from the now thoroughly pro-capitalist Socialist Party as easily as a passenger goes from one carriage of a train to another, underlining how far his former party had moved from the ideas of public ownership and planning that it once held. The primary selection process for the major right-wing party – recently re-named the Republicans – also brought about a surprise result. The two major contenders – Alain Juppe and Nicolas Sarkozy – were defeated by an “outsider,” Francois Fillon. A prime minister for five years, he wears Euro 13,000 suits and luxury watches and from Vladimir Putin received a gift of a bottle of Chateau Mouton Rothschild from 1931 – the year his mother was born. For everyone else he wants a program of “shock treatment” – austerity and deregulation, the slashing of labor codes, an increase in retirement age and “reform” of France’s esteemed welfare system. He sticks to a free-market platform and likes to invoke the memory of Margaret Thatcher in Britain. Fillon, representing the traditional right, was for a while, considered to be the candidate most likely to face the far right Marine Le Pen in the second round. But Le Monde points out that his position in the opinion polls has been falling ever since the end of last year. Then came the devastating revelations in the satirical weekly, Le Canard Enchaine, about huge sums of money ( Euro 700,000) fraudulently paid to his wife for a fake job as a parliamentary assistant (“Penelopegate”) and then similar stories about payments to his children. (Not long afterwards, Hollande was forced to announce the resignation of his Interior Minister, Bruno Le Roux for similar payments to his daughters during the school holidays.) Then news broke of Fillon taking a cool Euro 50,000 for “procuring” a meeting between Vladimir Putin and a Lebanese billionaire to fix up contracts in the oil industry. His star has plummeted. Patricians of the French right were already reluctant to support Fillon. Now they are deserting his camp in a steady stream. He remains adamant that literally millions of voters, reluctant to declare their hand at the moment, will turn out for him on April 23 – “The lost sheep will return to the fold” (Le Monde, April 1) . This is whistling in the dark to keep up your spirits. Many who would have voted for the Republicans with a different candidate have openly declared their support for the center candidate Macron in the first round. This indicates again how safe for the capitalist class this “independent” ex-“socialist” Macron appears to be. A few months ago, the dilemma for workers and young people, who have been angered by the Socialist Party, was not so much which of the several left candidates to vote for in the first round. The main question was that, if the ruling party was going to be punished and not reach the second round, could they bring themselves to vote for a “traditional,” bosses’ representative from the Republicans to stop the far right coming to power? Now, if it will still be a choice of Emmanuel Macron to stop Le Pen, many who see him as a parvenu with a record of anti-working class policies, will be unwilling to vote for him. The Financial Times on April 3 says. “Latest polls reveal that millions of voters from the traditional right and left of French politics are willing to cast their ballot for Ms Le Pen in the second round if their favoured candidate is eliminated.” But it adds, “Such is the dislike for mainstream politics, even more are said to be planning to abstain.” Young people and workers who hate Le Pen’s stance against immigrants and Muslims will go further. They will demonstrate their anger by going onto the streets before the second round of voting even takes place. Gauche Revolutionnaire (GR) – the CWI in France – is all in favor of such a development and will be there on the protests that take place, arguing for the building of a mass movement pf struggle against all representatives of the capitalist system. As far as the ballot itself is concerned, GR advocates voting for Melenchon in the first round and abstaining in the second (unless, of course, Melenchon defies all the odds to be in the run-off). While understanding that many workers and young people will go to vote, holding their noses, for any candidate to try and block the path to Marine Le Pen, they believe the most important task in the period after the election is to build a new mass socialist force. This would need to appeal to all those who have have voted for Melenchon and other left candidates and who have participated in the struggles of recent years. It could also attract the workers and young people who have stayed away from voting booths altogether – not seeing the relevance for them of today’s political system rigged in favor of the rich and powerful. One of the tragedies of the current situation has been that a large layer of youth have been actively involved in Le Pen’s campaign. The National Front has become the number one political party among 18 – 25 year-olds – the age-group that traditionally does not go to vote as much as older layers in France. These young people are said to be not too familiar with the FN program but want to vote against the system. Left and right populists seem to represent the people against the elite but the FN has appeared to them to be more determined than any other party to reap radical changes and improve life for the population of the second biggest economy in Europe. This in itself is a condemnation of all the parties of the so-called left who have failed to inspire them with the ideas of socialist change. In 2002, parties to the left of the pro-capitalist “Socialist” Party scored nearly 4 million votes in the presidential campaign – nearly 3 million for Trotskyist candidates as well as nearly a million for the Communist Party. Even in 2007 the joint score was nearly 3 million. But the opportunity for Trotskyists to form a new party offering a clear working class and anti-capitalist program was squandered. It is not impossible for the rising tide of support for Melenchon ’s program to be channeled into a genuinely socialist movement that can attract many of the workers and youth who have temporarily turned to the far right for a rebellion against the system. After the presidential election comes the question of the make-up of the parliament and government that the new president of France will be working with. A general election for the National Assembly will take place on June 11 and 18. The FN’s political fortunes have certainly risen recently, especially in the equivalent of France’s “Rust Belt” in the North East, and it still has solid support in parts of the South. However, in the unlikely but possible event of Le Pen being voted in as president, forging any kind of working majority in parliament with other forces would be a mountain to climb. She has also pledged that if her plan for a referendum on Europe to be held within six months of coming to power is implemented, and the vote to leave is lost, she would resign and live to fight another day. The most urgent task of the hour in France, as in so many other countries across Europe, is to build a new socialist party of workers and youth. Gauche Revolutionnaire puts forward in its newspaper – Egalite – the aspects of a socialist program that is needed and suggests expanding that of Melenchon’s FI along these lines. It also spells out the way in which the FI needs to operate in order to build a mass party of the working class. The next few weeks will witness further earthquakes in France’s political landscape, but as the world’s political and economic crisis deepens, the legendary combativity of the French working class will light a beacon internationally and, drawing the correct political conclusions, can point a way forward along the road of socialist transformation. Previous articleLa dirección Demócrata bajo presión. ¿Qué camino debe seguir la izquierda?